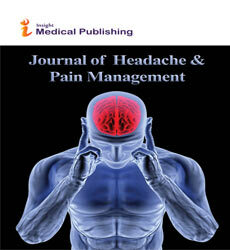 Journal of Headache & Pain Management is a scholarly research journal that imparts an ample scope for the researchers, scientists, pioneers and common readers globally to gain more information and awareness about the recent advancements and developments in the medical research of the interdisciplinary field addressing all types of ‘headaches’ and 'migraines' including its etiology, diagnosis, pathology and treatment. 'Journal of Headache & Pain Management' publishes scientific articles covering a wide range of research and study related to various headaches in the field of neuroscience and neurology. 'Journal of Headache & Pain Management' is an open access journal that thrives to provide and publish genuine and reliable complete source of data regarding the recently undertaken research topics and studies on neuroscience and neurology. This scholarly journal is using Editorial Manager® System for online manuscript submission, review and tracking. Editorial board members of 'Journal of Headache & Pain Management' or outside experts review manuscripts; at least two independent reviewer’s approval followed by the editor is required for the acceptance of any citable manuscript. Depending on the severity of the headache, there are two types of treatments: Acute treatment refers to medication that is taken to relief the pain instantly and Preventive treatment refers to the medicines which are taken in regular basis to prevent to future attacks of headache for all types of headaches like chronic daily headache, tension type headache etc. Acute treatments done by pain relievers such as aspirin, acetaminophen, triptans etc. and preventive treatments using anti-depressants, veramapil etc. Physical therapies like acupuncture etc. and a healthy lifestyle can also help. Journal of Pediatric Neurology and Medicine, Advanced Techniques in Biology & Medicine , Trauma & Treatment , International Journal of Physical Medicine & Rehabilitation , The Journal of Headache and Pain, Journal of Practice Improvement, The Journal of Head and Face Pain, the British Journal of Anaesthesia, The Journal of the American Osteopathic Association, The Journal of the American Osteopathic Association, New England Journal of Medicine, European Journal of Neurology, Journal of Consulting and Clinical Psychology, The Journal of Allergy and Clinical Immunology, Journal of Musculoskeletal Pain, Journal of Oral & Facial Pain and Headache. Various medicines are being used in migraine therapy as anti-Antidepressants, anticonvulsants, antihistamines, Glucocorticoids, analgesics, NSAIDS, triptans, caffeine, barbiturates and narcotic pain relievers. Migraine medications are of two types, one that abort or stop migraines from progressing once they start and the other prevents migraines from happening. Few medicines which are in excessive use are Aspirin, Naproxen (Naprosyn, Anaprox, Anaprox DS), Ibuprofen (Motrin), Acetaminophen (Tylenol) etc. International Journal of Drug Development and Research, Journal of Headache & Pain Management General Medicine: Open Access , Journal of Clinical Case Reports , Brain Disorders & Therapy ,Journal of Psychiatry, The Journal of Pain & Relief, Journal of Neurology, Neurosurgery & Psychiatry, The Journal of Head and Face Pain, Canadian Medical Association Journal, Journal of Medical Internet Research, Natural Medicine Journal, England Journal of Medicine, Journal of Medicine, The American Headache Society journal, European Journal of Medical Research, The Tohoku Journal of Experimental Medicine, British Medical Journal, Journal of the Medical Association of Thailand Journal of Pharmacy and Pharmaceutical , Cukurova Medical Journal. Migraines can be episodic or chronic. Chronic migraines are painful migraine headaches that last longer and occur more frequently unlike episodic migraines that show acute attacks of severe headaches that last for short duration occurring at longer intervals. It is a distinct and defined sub-type of Chronic Daily Headache. It predominantly affects one side of the head causing throbbing, pulsating sensation accompanied by severe pain, nausea; vomiting, sensitivity to sounds, smells, and light and vision changes. These migraine headaches are triggered by irregular food habits, hormonal imbalances, sleep disorders etc. Bipolar Disorder: Open Access, Head and Neck Cancer Research, Journal of Spine, Journal of Psychiatry, Journal of Neurology and Neuroscience, The Journal of Headache and Pain, Evidence-Based Complementary and Alternative Medicine, Journal of Contemporary Medical Education Periodical, International Journal of General Medicine, Journal of Neurological Disorders, New England Journal of Medicine, International Journal of Ayurveda and Pharma Research, Jundishapur Journal of Chronic Disease Care, World Journal of Biological Psychiatry. Migraine attacks are episodic indications of a genetic neurological disease. Hemiplegic migraine is unilateral weakness that accompanies a migraine headache attack in a rare case. A person with hemiplegic migraine experiences a temporary weakness on one side of their body as part of their migraine attack which can impair sensation and may undergo speech difficulties, vision problems or confusion. There are two types of hemiplegic migraine – familial hemiplegic migraine (FHM) and sporadic hemiplegic migraine (SHM). Journal of Neurology and Neuroscience, International Journal of Neurorehabilitation, Journal of Psychiatry , International Journal of Physical Medicine & Rehabilitation, A Journal of Neurology, The Journal of Head and Face Pain, The Lancet neurology, International Journal of Medical Research & Health Sciences, The New England Journal of Medicine, Journal of Biological Chemistry, Journal of Pediatrics, Journal of Neurology, Neurosurgery and Psychiatry, Iranian Journal of Child Neurology, Journal of the Neurological Sciences, Biophysical Journal, European Journal of Pediatric Surgery. Journal of Neurology and Neuroscience, International Journal of Collaborative Research on Internal Medicine & Public Health, Journal of Headache & Pain Management, Journal of cerebral circulation, The journal of Pediatrics, The British Medical Journal, The Journal of Head and Face Pain, Journal of Family Practice, the journal Headache, The journal of Neurology, American Journal of Medicine, Egyptian Journal of Neurology, Psychiatry and Neurosurgery, The New England Journal of Medicine, European Journal of Neurology,A Journal of Neurology, Journal of Pediatrics, Journal of Neurology, Neurosurgery and Psychiatry, Iranian Journal of Child Neurology, Journal of the Neurological Sciences, European Journal of Pediatric Surgery. Brain Disorders & Therapy , Journal of Neurology & Neurophysiology , Current Neurobiology , Epilepsy Journal , The Journal of Head and Face Pain, the British Journal of Anaesthesia, Journal of Neurology, Neurosurgery and Psychiatry, The Journal of the American Osteopathic Association, journal of neurology, Scandinavian Journal of Pain, The New England Journal of Medicine, Karen's Journal of CSF Leak Headaches and Chronic Pain, Journal of the Italian Neurological Society, The Journal for Nurse Practitioners, The American Journal of Medicine, The Journal of Headache and Pain. Tension type headache is also called chronic daily headaches or chronic non-progressive headaches. This is one of the most common types of headache caused by the tightening of the muscles in the back of the neck and scalp resulting in reduced blood flow to the head that irritates the skin, muscles and the blood vessels. It promotes a steady, constant pain on both sides of the head which can last for hours, days or months which can later turn chronic. Tension type headaches are triggered by muscle strain, stress, fatigue, sleep disorder etc. Journal of Dementia & Mental health, Journal of Neurological Disorders, Journal of Headache & Pain Management, Journal of Psychology & Psychotherapy, European Journal of Neurology, The Lancet Neurology, International Journal of Epidemiology, Journal of the Japan Medical Association, Journal of Consulting and Clinical Psychology, Journal of Psychiatry, The journal Cephalalgia, Nutrition Journal, Global Journal of Health Science, Journal of Manipulative and Physiological Therapeutics Home, Zahedan Journal of Research in Medical Sciences, The Journal of Headache and Pain. The term ‘vascular headache’ was formerly used to describe certain types of headaches which were thought to be caused by the vascular effects like blood vessel swelling or other sensitivity of the arteries, hyperemia etc. Mainly dilation of the blood vessels causes this pounding or throbbing pain usually on one side of the head. Migraine headaches and cluster headaches are considered to be the most common type of vascular headache. It is triggered by stress, diet, weather change, light etc. Journal of Spine, Brain Disorders & Therapy, Journal of Psychology & Psychotherapy, International Journal of Neurorehabilitation, The Journal of Headache and Pain, Journal of the American Medical Association, Journal of Neurology, Neurosurgery & Psychiatry, Canadian Medical Association Journal, Journal of Allergy and Clinical Immunology, Journal of the American Medical Association, Journal-Pharmacy World and Science, Journal of Consulting and Clinical Psychology, Journal of Psychiatric Research. A throbbing headache is a sensation of pounding, heaving, periodic, or explosive pressure in the head that affects all or a portion of the head. Throbbing headaches are often associated with migraine headaches, caffeine withdrawal, hangovers, Stress headache, cluster headache and sinusitis. It shows symptoms of nervous system disorder, nausea, vomiting, visual changes, other sensory changes, other body system disorders etc. Trauma & Treatment, Journal of Clinical & Medical Genomics, Journal of Neuroinfectious Diseases, The Journal of Headache and Pain, The British Journal of Anaesthesia, The Journal of the American Medical Association, The British Medical Journal, Journal of Clinical Pharmacy and Therapeutics, The Wall Street Journal, The journal Neurology, Journal of Allergy and Clinical Immunology, Journal of Neurology, Neurosurgery & Psychiatry, Journal of Headache Pain, Journal of the American Medical Association. In women, the female hormone estrogen is responsible for the occurrence of the migraine headaches. The fluctuation in the hormone levels during the fluctuating hormone levels menstrual cycle, pregnancy, and menopause, and are also affected by oral contraceptives and hormone replacement therapies are a major contributing factor in hormone headaches like chronic headaches and menstrual migraines. Journal of Psychiatry, Journal of Steroids & Hormonal Science, Journal of Headache & Pain Management, Endocrinology & Metabolic Syndrome, Journal of Autacoids and Hormones, The Journal of Headache and Pain, Canadian Journal of Neurological Sciences, Journal of Neurology, Neurosurgery & Psychiatry, The Journal for Nurse Practitioners, Journal of the American Medical Association, Cases Journal, Head and Neck Journal, Journal of Alternative and Complementary, American Journal of Clinical Nutrition, The Journal of the American Medical Association, The journal Cephalalgia, The International Journal of Biomedical Research, International Journal of Womens Health.